Miatas Before the Gap Aug 1st 2019 - Miata Turbo Forum - Boost cars, acquire cats. Local Meets, Events and Tech Days Track Day? Autox? Tech Day? Beer Run? Dave and Busters? 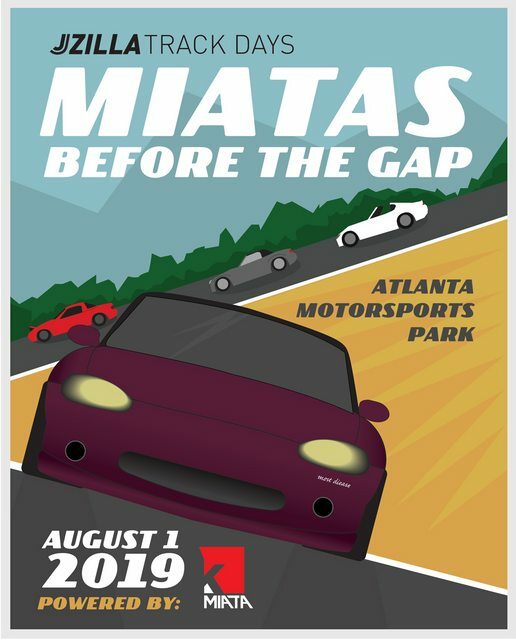 Jzilla track-days is once again hosting a miata track-day the Thursday before Miatas at the Gap, Aug. 1 2019. Great event last year, even with the rain. Who as is planning to attend? Last edited by flier129; 04-03-2019 at 10:01 AM. Would like to. Will have to drive sanely. Planning on it unless I get too busy with SuperMiata East. Can't wait, hopefully we get to drive this track in the dry this year too. We'll be bringing 3 cars again and giving ride-alongs too. Last edited by rwyatt365; 04-05-2019 at 11:18 AM. I'll definitely be there this year, last year was a blast even in the rain! I know a few people who came down ran afoul of AMP's sound limits last year weren't happy. I didn't see it posted anywhere on the event information. I know my car comes just under the limit (hi-compression VVT, RB header, test pipe, and Magnaflow exhaust. Per AMP's website, "The limit is 98 db at 50 feet from track edge, inside and outside for cars"
There's no excuse for a street car being louder than that anyway. And cops should be ticketing the fagg0ts on those Harleys as well. Get off my lawn! Haven't you heard? Loud pipes save lives!! Not riding Harleys saves a lot more. Most of the deaths around here are with loud pipes and no helmet so I'd say the pipes don't help with traumatic brain injury. Steve, you guna come drive AMP this year?! Not sure yet. I've got to get motivated to finish my modifications and get the car back on the road right now. I just put a tubular subframe from V8 roadsters under the front and added a much larger radiator. Still have to do new undertray and alignment and figure a few other things out. A few other issues I'm going to be a wimp about. I don't like track days in the heat very much, I worry about breaking the car and not being able to drive it the whole weekend, and I've got to carry even more spare stuff for a track day. Additionally, my buddies from down here usually can't take that many days off and last two years I had people riding with me up to the event. Last edited by sixshooter; 04-12-2019 at 01:09 PM.